I use the Uni Power Tank. I use this also. It writes well under all conditions. Firstly, I don’t SOTA in the rain. If weather is inclement I take a tent. Secondly, I haven’t used paper, pen or pencil since February 2013 preferring to use my Android logging app VK port-a-log. Trying to do it without pen and with VK-port-a-log here, too, Peter - and gaining experience even outside at winter temperatures coming now here in Europe. dou you refer to this one? It is 11 USD in the US. It doesn’t actually have to be raining to stop regular paper from working. The slightest humidity in the air can make it a real pain. So Rite in the Rain notepads for me too. They really are the best. And with capacity for 2300 logs, I have never felt compelled to restrict their use to good wx days. With a RitR pad, you simply can’t go wrong with a normal HB pencil. Yes, the Stowaway is what I use. I drilled a tiny hole in the cap, stuck a short piece of 30 pound test braid through it, tied some knots so it can not come back through, then tied the short tether to a solder lug mounted on the outside of the case. The pen writes upside down underwater on butter. It also writes at any altitude. The “more robust” version is 1) more expensive, 2) larger, 3) heavier. - Fred PS TNX for the tinySWR which I have built into my MTR3 and MTR5. I personally log with my phone. It comes with me everywhere so 0g of additional weight. If I have enough cell service I can submit my logs before leaving the summit, so I can relax at home instead of transcribing logs. I use HamLog from Pignology. Exports as a SOTA CSV. No paper or writing utensil for me. I do the same. I generally pack a few leafs of rite in the rain and that space pen just in case something happens to the phone. I’m packing my paranoia I think though! Here’s what I just ordered three of - OK I know they’re cheap but I’ll let you know how good they are (or are not), Once I have them in a few days. 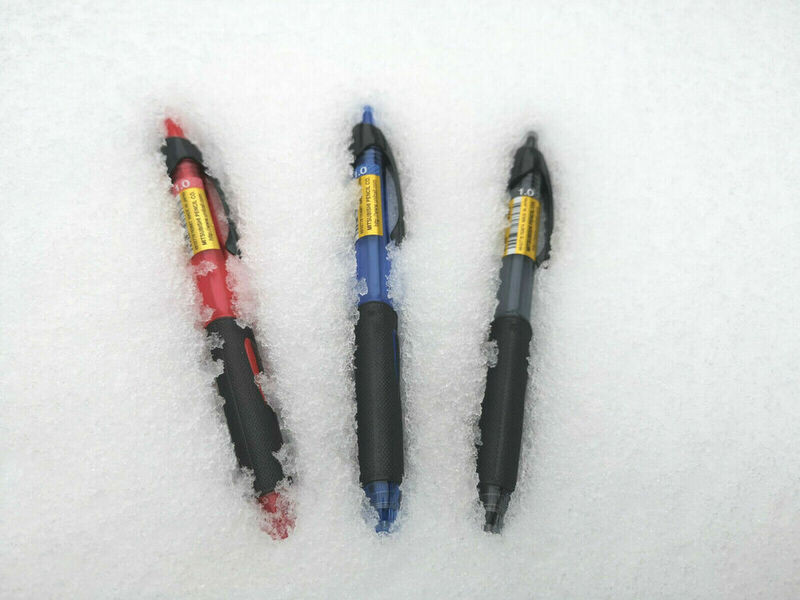 Unterwasser Kugelschreiber Stift Kuli Regen Frost kopfüber outdoor schreiben | Sammeln & Seltenes, Büro, Papier & Schreiben, Füller & Schreibartikel | eBay! Yes, NASA spent a lot of money on a pen and Russia used pencils. The reason being NASA was concerned about debris from the pencil floating in zero gravity and shorting electronics. I have used Fisher Space Pens as well. The ink deposited to paper is very anemic. If they can design a pen to write in space, why can’t they make the output look more like real ink? If that is the best they can do, they can keep them. The humble pencil with a Rite in the Rain 4" X 6" spiral bound notebook takes some beating for SOTA Portable work. I have used for nearly every SOTA activation I’ve done an A6 sized piece of aluminium in landscape orientation with a bulldog clip to hold the logsheets on and half a pencil tethered to the clip with a bit of string. Can’t claim any originality, bought it from SOTAbeams many years ago but Richard doesn’t seem to do them any more. Only variation is I print A5 log sheets that wrap around the board, top and bottom of the sheet going under the clip. Doubles the capacity with a flip of the board, and never to my recollection had a logsheet blow away yet! how can log in with phone with touch display on -10 and rain…? with gloves? So need to buy extra gloves or display gloves mode …!?! how can log in with phone with touch display on -10 and rain…? Yes indeed… that reminded me of my activation of Broad Law GM/SS-029 when I was trying to self-spot using my phone and the drops of rain were deleting my typing as fast as I could write. Logging with my phone would have been impossible. 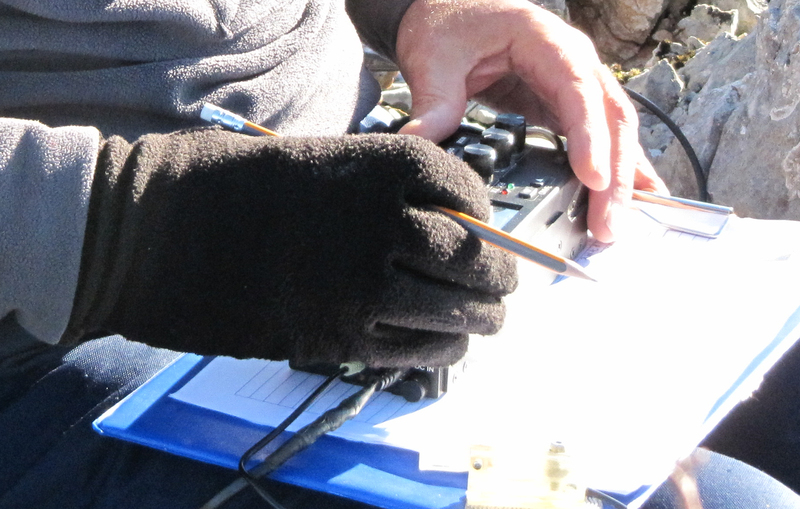 Like Gerald, there are reasons why I won’t electronic log on a summit with fingers on a phone or tablet screen. At home everything is logged electronically and nothing is written down. I wouldn’t mind entering calls and reports into a small laptop on a summit, and then in CW using the F keys storing RST / TU in the memories to send an exchange as one would in a contest (I know some SOTA ops do this - its very effective). I could see benefit in that, but the carrying and possible damage to a notebook due to weight carrying, wind, rain and cold puts me off using that type of device on a summit. If a tablet or phone was used refocussing of the eye and the hand and the delay in going back to the paddle key after each QSO woudl be awkward for me. Most of the chasers callsigns are now very familiar to me (the usual suspects) as I hear them chasing alongside me nearly every day - you get to know the callsigns off by heart in most cases. This means it is possible with practice to hear the station of interests callsign in CW or SSB and return the call immediately without delay. Most often I can then write it in the logbook when that Chaser is coming back to me with his report, so we get a good flow with no pregnant pauses and this leads to a smooth running activation. I don’t think I would quick enough to repeat the same process on a phone or tablet with my fingers and retain the fluidity of the activation, hence I stick to pencil and paper. PS I with Ivica also, old - 66 turns on my tank coil.